IMG_1096, originally uploaded by All Things Mimi. I know this is a horrible picture, but I tried several times and this was the best I could do. I made Leeky Creamy Chicken and Dumpling Stoup for dinner and decided I needed to serve a salad along side- mostly because I was craving veggies again. So I cut up some romaine hearts and threw on some raw onion, cucumber, mushrooms and avacado. I then had to consider the dressing options. In my blender I threw a couple of globs of champagne honey mustard, some fig vinegar, a splash of white wine, salt, pepper and some olive oil. I whizzed it around for a few seconds and voila! Not bad for dressing on the fly. The mayonnaise biscuits are an old family recipe. The recipe comes from an old church cookbook. It is ridiculously simple and NEVER fails. 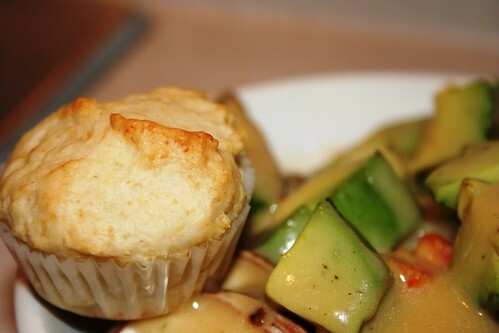 Mix everything together and put in a muffin tin, half way up to the top. I made teensy little muffins to be cute, but Dev requested larger ones next time. He ate like 6 of them with dinner. Bake them at 400 degrees until they are golden brown on the top. Mine took maybe 15 minutes. Mayonnaise biscuits?? How have I never heard of these before? They sound fantastic! I know....kinda weird, huh? If my mom hadn't made them for us as kids, I'm sure I would have never found this recipe.